Background: Meningioma approximately accounts for 20% of intracranial mass. It is usually located in the subdural space which is represented as the most common non-glial intracranial primary mass. Extracranial extensions of meningioma are rare. 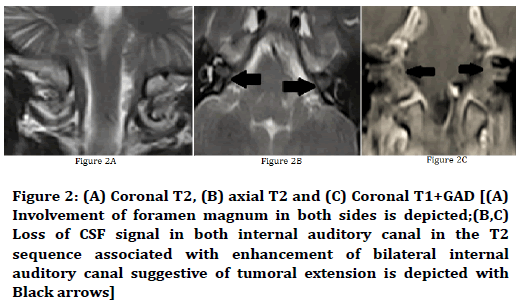 The main goal of this report was to evaluate of radiologic specific features on circumferential meningioma especially invasion to the inner ear canal and cervical spinal canal. Case presentation: An 18-year-old boy was admitted for the gradually progressive weakness of both upper limb and voiding dysfunctions for the last 2 week. Neurologic examination demonstrated a bilateral hemiparesis with 2/5 force in upper extremities and 4/5 force in lower extremities. Brain and cervical spine MRI showed irregular thickening of Dura of clivus with extension to foramen magnum, bilateral internal auditory canal, planum sphenoidal, tentorium and encircling of upper cervical spine. By pathologic result diagnosis of meningioma was confirmed. Conclusions: This is the first reported case of a cervical spine meningioma that completely encircling the cervical spinal cord with widespread intracranial extension in Iran. Although early diagnosis and strategy of surgery have shown dramatic results for meningioma, these lesions may be associated with poor prognosis because complete resection is impossible and suitable method of treatment for this case is unknown. Destiny of treatment in cases like this is decompression of spinal cord for symptom relief. Meningioma approximately accounts for 20% of intracranial mass . 90% of them are growing slowly as benign tumors and the others are malignant . Meningioma is usually located in the subdural space which is represented as the most common non-glial intracranial primary mass. Intracranial Meningiomas are common Brain tumors, but massive ones with extracranial Extensions are rare. They present as extracranial Soft tissue masses, seldom. Surgery is the principal part of treatment and must be preceded by suitable diagnosis [3-5]. Therefore, the goal of this study was to evaluate the circumferential meningioma of the cervical spinal cord with widespread intracranial extension in an 18-year-old boy. An 18-year-old boy was admitted to a referral hospital for Upper limb hemiparesis. He had gradually progressive weakness of both upper limbs for the previous 4 months and difficulty in walking and voiding dysfunction for the last 2 weeks. The patient did not have any problems in past medical and drug history. He also did not mention any family problems for mass or malignancy. Neurologic examination demonstrated a bilateral hemiparesis with 2/5 force in upper extremities and 4/5 force in lower extremities. Digital teleradiology (DTR) was positive and the gate was spastic. For further evaluation Brain and cervical spine magnetic resonance imaging (MRI) was done that showed the sheet-like and irregular thickening of Dura of clivus with extension to foramen magnum, bilateral auditory canal, planum sphenoidal, tentorium and encircling of the upper cervical spine (C1-C6). Biopsy from mentioned lesion was done and according to pathologic result diagnosis of meningioma was confirmed. According to the widespread extension of mentioned tumor complete resection was impossible so for symptom relief patient undergone surgery through posterior laminectomy and resection of posterior part of cervical spinal canal component. Fortunately after two weeks obvious resolutions of symptoms was achieved and after 3 months complete resolution of symptoms was seen. Because of high incidence of recurrence baseline postoperative MRI was done to follow up the tumor residue and possible recurrence (Figures 1-4). This is the first reported case of a cervical spine meningioma that completely encircling the cervical spinal cord with widespread intracranial extension in Iran, which is a finding novelty in area of research. The venous meningioma of the spinal is an expanding tumor toward Dura mater. This mass crosses on some of the vertebrae and is difficult to the treatment. On MRI, this type of tumor is reported as a homogeneously enhancing mass . This view in MRI has some differential diagnosis as tuberculosis, metastasis and lymphoma. Furthermore, lymphoma was initially considered to be the most likely differential based on the diffuse of soft tissue involvement and dense enhancement shown on MRI [7-9]. However, it is difficult to determine the definite diagnosis from each other and histopathological reports resolve this problem . But, the best option for meningioma lesions is surgical excision . 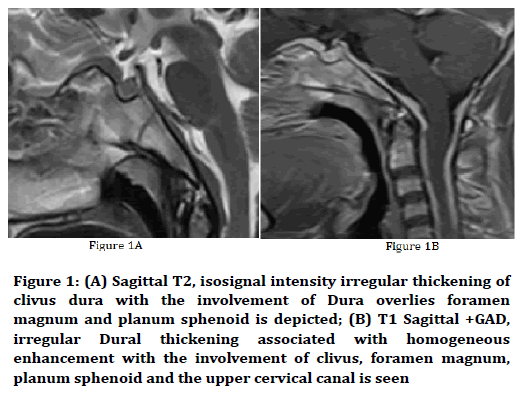 In this case report, isosignal intensity irregular thickening of clivus dura-associated with homogeneous enhancement with the involvement of Dura overlies foramen magnum and planum sphenoid, clivus, foramen magnum, and the upper cervical canal is seen. The patient had a surgical biopsy which was reported meningothelial cells with indistinct cell borders, whorled pattern and epithelial membrane antigen (EMA) positive meningothelial cells. Although early diagnosis and strategy of surgery have shown dramatic results, these lesions may be associated with poor prognosis especially when the lesion is complex and the complete resection of the tumor is impossible. After partial resection for relief symptom the patient will require surveillance scans at regular intervals, and if a recurrence is depicted, then further surgery could be considered or radiotherapy should be done to prevent further tumor growth . The mentioned case is the first report of a meningioma that completely encircled the cervical spinal cord with widespread intracranial extension. Optimal management of this sheet-like meningioma is unknown however symptomatic relief with cord decompression is an early target. Complete resection is very difficult to achieve in this circumstance; therefore, serial imaging and longterm follow-up will be required. 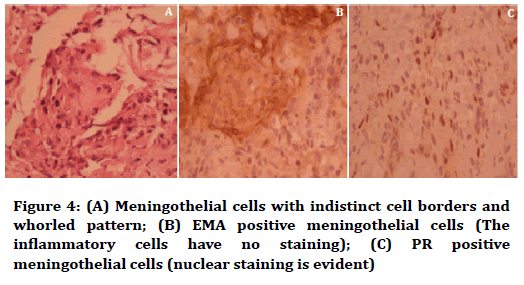 Liu Y, Song DP, Wang T. Meningiomas with different histological grade in the same patient: Case report. Medicine (Baltimore) 2017; 96:e9086. Redjal N, Agarwalla PK, Dietrich J, et al. Remote acute demyelination after focal proton radiation therapy for optic nerve meningioma. J Clin Neurosci 2015; 22:1367-9. Sinurat R, Banjarnahor JD. Incidental bleeding meningioma. Asian J Neurosurg 2017;12:247-9. Otoukesh B, Boddouhi B, Moghtadaei M, et al. Novel molecular insights and new therapeutic strategies in osteosarcoma. Cancer Cell Int 2018; 18:158. Anthofer J, Seidel-Schulz R, Proescholdt M, et al. Meningiomas adjacent to major venous sinuses-clinical outcome and recurrence. World Neurosurg 2017; 104:560-6. Sivaraju L, Thakar S, Ghosal N, et al. Cervical en-plaque extradural meningioma involving brachial plexus. World Neurosurg 2017; 108:994.e7-e10. Hale AT, Wang L, Strother MK, et al. Differentiating meningioma grade by imaging features on magnetic resonance imaging. J Clin Neurosci 2018; 48:71-5. Kreil W, Luggin J, Fuchs I, et al. Long term experience of gamma knife radiosurgery for benign skull base meningiomas. J Neurol Neurosurg Psychiatry 2005; 76:1425-30. Jimenez-Caballero PE, Diamantopoulos-Fernandez J, Camacho-Castaneda I. Hypertrophic cranial and spinal pachymeningitis. A de-scription of four new cases and a review of the literature. Rev Neurol 2006; 43:470-5. Kim Y, Cho HH, Kim ST, et al. Radiomics features to distinguish glioblastoma from primary central nervous system lymphoma on multi-parametric MRI. Neuroradiology 2018; 60:1297-305. Gamache FW Jr, Wang JC, Deck M, et al. Unusual appearance of an en-plaque meningioma of the cervical spinal canal. A case report and literature review. Spine 2001; 26:E87-9. Citation: Mersad Mehrnahad, Hossein Soleimantabar, Abdolali Ebrahimi, Bahareh Heshmat Ghahderijani*, Circumferential meningioma of the cervical spinal cord with widespread intracranial extension, J Res Med Dent Sci, 2019, 7(1): 44-46.